As an entrepreneur in the era of digitalization, I know that digital marketing is an important factor for businesses to grow. And so I always keep my eye on how is my business website performing on Google and other search engines. There are lots of intelligent marketing tools, that help boosts your organic traffic and finds better keywords to outrank competitors. I’ve been using SEMrush for the last couple of months and believe me it is an ultimate solution for all your SEM based needs. It has carved a niche for itself among other SEO tools by gathering a strong base of over 700000 users! SEMrush has 30 bases which contain whopping 120+ million keywords. Containing data of over 73 million domains, it is a one-stop shop solution for all your SEO based needs. Let dive deeper into this review see how SEMrush’s features can be implemented in your SEO strategy. Who is SEMrush competing with? Why are Long Tail Keywords necessary? How to view competitor’s backlinks? SEMrush is a paid SEO tool that has been used by many experts for increasing traffic, finding keywords and building backlinks. This tool is proficient in helping you outrank your competitors by providing you with an access to their backlinks, keywords and checking their website traffic. We reviewed SEMrush Rank’s interface and found it to be user-friendly and easily navigable. While the main tabs are displayed on the top bar of the home page, other section feature in the sidebar on your dashboard. Overall, the interface is simple but it could have been better! Site Audit – Using this audit tool, SEMrush allows you to carry out an SEO audit of your site so that you can spot areas that need to be improved. Analyzing Your Competitors – If you wish to outrank your competition, SEMrush gives you an insight of their data and their strong points as well. Advanced Keyword Research – Keyword research is one of SEMrush’s best features. Apart from searching for basic keywords, one can also perform an advanced search to find out keywords used by competitors to rank. You can also use related keywords feature that could also be utilized in your niche. Easy Link Building – Link Building becomes even more simple when you use this SEO tool. You can get your hands on all backlink data of your competitor. Organic Findings – You can generate an organic research report with this tool when you enter a domain name or keyword phrase. This will indicate the steps that need to be taken to build a proper SEO based plan. PPC Advertising – PPC or Pay per click advertising can fail if the right keywords are not chosen. You can lose on a lot of investment as well. SEMrush allows you to take a peek at the keywords your rivals are using for their ads. Social Media Marketing – Social media is extremely powerful if you wish to increase your site traffic. With SEMrush, you can create brand awareness through social media. 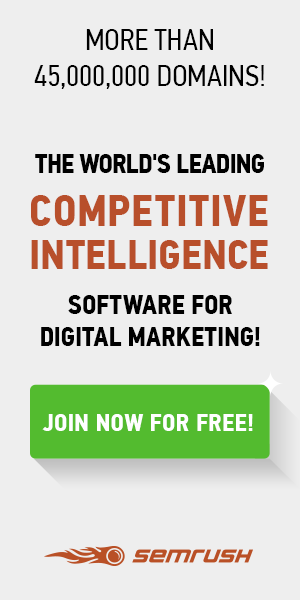 SEMrush is competing with other SEO software including Moz Pro, Serpstat, Ahrefs, Majestic and SEO Power Suite. SEMrush offers 3 plans that range from $99-$399 every month. The $99 plan is called Pro, $199 is called GURU and $399 is known as Business! The $99 plan is appropriate if you have a small business. However, for SEO experts or a big business then Guru and Business plans are better suited. The $99 Pro plan has all the required features and the only difference is that it has lower data accesses. Historical data, white labeled reports, and API are not provided with this plan. You can also opt for customized plans if you require a few extra features. SEMrush also offers a 7-day cash back guarantee. The volume of traffic received depends on the keywords you find and use. Keyword research is the best way to increase traffic to your website. While many people use free tools Google Keywords Planner or other keyword research tools, SEMrush offers a paid service which helps you find much better keywords that are competitive and can give you sure shot results. It also specifies the volume at which the keyword is used which enables you to pick the keyword easily. Click on view full report to view other related keywords apart from the one that you have entered. If you wish to do a thorough keyword research, then there is nothing better than SEMrush. Irrespective of the niche you specialize in, you can find all possible keywords present in the database. The number of pages seen in results of search engine. The PPC or Cost Per Click required to advertise the keyword. The density of each keyword used in comparison to your competitor’s site. The number of Phrase Matches – phrases containing the targeted keywords. Similar keywords which are related to the target keyword in any way. With the phrase match and related keywords, you have the option of viewing reports that have multiple pages of keywords and tons of other data. Changing trends of keywords can be viewed in terms of volume changes and complexity of keywords. The search for the keyword is also reflected country wise. Take a closer look at the first 100 URLs that have been ranking due to that specific keyword. These URL links are clickable which enables you to view them. View the kind of ads your competitors are using to imbibe the keyword. You can also view visual ads for product related ads. View the changing trend of ads and their history over a period of time. You can see the cost per click country wise and search engine wise. When you view the keyword for the competition it has and the number of sites which are targeting the keyword and what you would have to face to outrank them. For instance, if you have written a particular article and you are looking for keywords to be included in the same then you can generate the list of keywords which can be used in the article, URL, subheadings, Meta Title, Description etc. Enter them into the keyword difficulty tool and you can generate results of its effectiveness. The ads history tool helps in many ways. You can get an idea of who has been targeting keywords in ads and how much traffic the keyword has generated for your competitors. You can also get to know how much was paid in the whole advertisement campaign. The next feature we are going to tell you will leave you dumbfounded about the Ads History tool. This SEMrush features also give you an insight into how important these keywords are to your competitors. This is one feature which will unleash your competitor’s ad campaign after which you can decide if you wish to duplicate the same. If you are utilizing cost per click advertising in Google AdSense then you can base your research according to previous CPC ads. There is a column for CPC value which can be used to set Cost per Click values. By doing this, you will be able to generate results with keywords of other costs per click ads which are in the same category as yours. Your competitor’s PPC campaign will never remain static. You will be astounded to know that you can track the changes in their campaign as well. The report generated for Position changes will let you track changes taking place in your competitors paid search campaign. You can track changes like new keywords included and new ads launched. If your competitors are going down on visibility, you can launch your ads. You can also improve the quality of your own ads according to the changes made in your competitors landing pages. You can view the following changes when it comes to the ad campaigns of your competitors. Newly Added Keywords – You can detect keywords that are getting clicks that weren’t prior to this. Lost Keywords – Show keywords that your competitor has lost out on. The Improved and Declined Keywords – This report will indicate where your competitors are improving and where they are not in the rankings. All the above-mentioned data will help you in increasing traffic to your website and improve ranking. Long Tail keywords are important because they are more specific keyword variants and they comprise of at least 4 keywords which are more likely to get clicks when compared to single word keywords. Long tail keywords are beneficial as they have lesser competition and the cost per click is low. On the whole, these are extremely beneficial for ranking. SEMrush gives you the option of finding these keywords using the Keyword Overview Report. In order to find these long tail keywords, you can scroll on the Phrase Ad. Select Phrase and Related Keyword reports where you will be able to access all the long tail keyword variants you might have not even heard of. SEMrush generates keyword volume along with keywords. Sometimes, it is recommended that you do not use a keyword that has a high volume as ranking with a lower volume keyword is much easier. It Is always better to choose keywords with a volume of 1000 and lower. With SEMrush, you can get the volume of all the keywords within seconds. To use this feature, you simply need to select the include option and then select volume. You will then have to choose the value of the keyword which will be less than or equal to. You will now be able to view the volume for all the keywords. Backlinks are an important part of SEO. SEMrush allows you to perform a complete analysis of your competitor’s backlinks. High-quality links are the most effective way of boosting your organic traffic. Through SEMrush, you can analyze the source of the backlinks which will facilitate easy link building of your own website. When you enter any keyword or the website URL, you will be able to view how backlink analysis works. This is extremely helpful if you wish to view from where the backlinks of your competitors are coming from. SEMrush gives you the chance to analyze backlinks of your competitor by doing a complete audit. You can unravel information such as the number of backlinks and the domains where these links are distributed. You can map your competitors link building strategy by using this feature and build backlinks for yourself. When you click on Backlinks and go to the overview section, you can paste the link of your competitor’s website. You will now be able to view all the backlinks of your competitor and the type of backlinks that your competitor is getting. Useless backlinks can cause the destruction of your site from the SEO point of view. They can also cause a penalty to your website through Google. SEMrush can help you here as well. An inbuilt tool can help you discover bad backlinks and remove them in a few clicks. You will have to add your project within SEMrush and then choose the Backlink Audit option. Click on set up and choose options accordingly. Once your set up is complete click on Start Backlink Audit”. When it is complete, you can see a domain overview. If you are able to see a low score and fewer number of toxic links, you will be able to judge that your website is fine. However, a highly toxic score and 4-5 toxic links are potentially bad. You will also be able to view the number of backlinks which are toxic so that you can identify and remove them. You can click on each link and view the website to remove these links one by one. If you click on the link and it has no connection with your website, then you can see an option in the right -hand corner to disavow or whitelist the link. This feature ensures that your website is toxic backlink free at all times! Like the Backlink Audit feature, you can also perform site audit. If you are unable to identify the reason why your site is not able to perform then SEMrush’s Site Audit feature is the solution to your problem. With this feature, you can perform a complete check of your site and spot errors. Site Audit helps you in finding issues such as lengthy title tags, broken links, and other SEO related issues. When Site Audit is done, SEMrush issues warnings, duplicate content problems, and much more other errors. Once these problems are rectified, you will be able to see an improvement in ranking. Once you fix them on your site, in no time, you will see your search rankings going up. When Site Audit is done, SEMrush issues warnings, duplicate content problems and much more other errors. Once these problems are rectified, you will be able to see an improvement in ranking. Once you fix them on your site, in no time, you will see your search rankings going up. Checking your own website traffic is a normal procedure. You can sign in to your Analytics account and check the same. SEMrush rank helps you in checking your competitor’s website traffic and search engine visitors. SEMrush offers a Social Media Tool. It helps you in the analysis of how your social media tool is performing. For this, you will first have to include your project in the My Projects section and then link your social media accounts to it. Through this tool, you can check the number of people visiting your social media profiles at networks such as Google+, Instagram, Facebook, and YouTube. You will also be able to view a Top Content section that showcases the most viewed post during a particular time period. You can also compare your social media statistics against your competitors. To do this, you will have to add your competitors when you set up your projects. Through the social media tool, you can also track an increase and decrease in the audience on all social media platforms. SEMrush can be effectively used as a brand monitoring tool. In today’s’ day and age where digital marketing affects the reputation of your brand, it is necessary to keep a track of it. You can track reviews and mentions of your brand or service on the internet and social media. You can also do the same for your competitor and use their strategies to help in increasing goodwill and awareness of your brand. Like all other SEO tools, SEMrush has pros and cons alike. We have listed them below. SEMrush offers an array of solutions at one place. Offers access to Advertisement and PPC solutions. Generates substantial data reports suitable for small businesses, large businesses and individuals as well. Allows generation of over 10000 reports per day with the business subscription and with the other subscriptions you can generate 3000-5000 reports every day. Gives you detailed information about traffic cost which gives you an idea of how much your organic traffic is worth. You can compare between 5URLs like traffic from PPC ads over a period time. Access to competitor data such as pages with the most amount of traffic. Gives you information about your position and ranking. Allows integration with Google Analytics and Google Search Console thereby facilitating the analysis of your website efficiently. Offers good customer support and a solid information base to its consumers. Continuous enhancement and improvement of features for optimum performance. SEMrush does not use clickstream data which is known for making keyword volume more accurate. Backlink database is not the strongest. Semantic Keywords generation is weak in SEMrush. Search engine results page and its coinciding features like rich snippets are better used in SEMrush’s competitor tools. Certain data discrepancies have been reported in the tool. If you want an efficient SEO tool then look no further than SEMrush! This all in one tool helps you in getting your hands on your competitor’s keywords and gives you a complete analysis of what is doing well for them thereby helping you in outranking them. However, something that SEMrush lacks in is a big backlink database and keyword data. When compared to its other competitors, SEMrush has an edge with features like historical an information, projects and rank tracking. Start using SEMrush by signing up for its free trial feature. It is the best way to get a hang of its features before you opt in for its paid services.